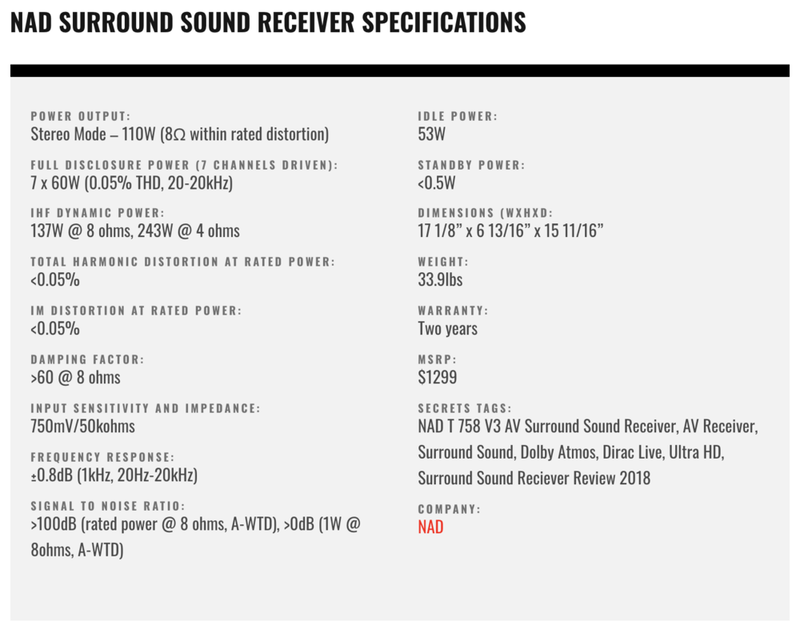 Secrets of Home Theater: "NAD T758 V3 AV Surround Sound Receiver Review"
I’ll admit, I’m somewhat snobbishly proud of my surround audio system. I have a stack of big heavy amplifiers from Emotiva and a fancy Integra processor driving five big speakers and a massive 800-watt subwoofer. But the pull of Dolby Atmos is strong and I really want to add that functionality to my home theater. I realize however, that most people would prefer something simpler and less expensive. NAD understands this and is now offering the T 758 V3 AV Surround Sound Receiver. For $1300, you get enough amplifiers and processing for a 5.1.2 Dolby Atmos setup, and if you add a two-channel power amp, you can go to 5.1.4 or 7.1.2 using the included pre-outs. I was intrigued to see just how little one could spend on a Dolby Atmos system so I requested the T 758 V3 along with two PSB Imagine XA height modules that sit on top of the front tower speakers and fire at the ceiling. These have already been reviewed by Secrets so I won’t be offering in-depth commentary on them. You can find Piero Gabucci’s review here. What we have then is a Dolby Atmos upgrade to my existing setup for a grand total of $1800. Let’s take a look. When considered purely as a receiver, the T 758 V3 follows NAD’s design mantra of simplicity and clean sound. There are no bells and whistles here, no pseudo surround modes or other trickery. The power amp section hits 60 watts with all seven channels driven and 110 watts in stereo, both at eight ohms. This is NAD’s honest power rating and I suspect if I measured it, the number might be a tad higher. I know that it has no problem driving my three front speakers which are large four-ohm full-range models from Axiom. The Class A/B power amp section delivers clean sound with a super-low noise floor and rich dynamics. The chassis is sized similarly to other receivers in this price category and should fit perfectly into any rack or cabinet. Heft is reasonable at just under 34 pounds. The front panel is simply adorned with just a large volume knob; and buttons for source selection, menu, and listening mode. A small joy-pad moves the user through various options on the large display. It can be configured and dimmed in the OSD which appears on a connected video display. A quarter-inch headphone jack sits in the lower-left under the power toggle. A small cover on the right comes off to reveal RCA, optical, and 3.5mm inputs. Ventilation is generously provided by a grill on top though I didn’t feel excessive heat coming out, even when things got loud. There are seven amps in the box which can be configured as 7.1 or 5.1.2 speakers for Dolby Atmos. If you want to go 7.1.2 or 5.1.4, two additional pre-outs are provided on the MDC board. You’ll need to connect these to an outboard two-channel amp to power your extra speakers. The board also contains the T 758’s digital inputs which include three HDMI in and one out, all version 2.0a with HDCP 2.2, ARC, and CEC. Two-channel inputs are covered with two each of coax and optical digital. You also get a full 7.1 set of multi-channel inputs, something not seen on many modern receivers. Three stereo inputs and a zone 2 output complete the analog package. Control is provided by an IR input with two outputs. And there’s a 12V trigger as well as RS-232. If you prefer to supply your own power amps, 7.1 pre-outs are there too. The USB port is used with the included BluOS module which adds streaming and network functions. Without it, there is no built-in Wi-Fi. This is important because if you want to use Dirac Live, you’ll need to install that module, more on it below. You also get all the advantages of BluOS and its streaming capabilities. To access thousands of songs, just choose the BluOS input and use your favorite service like iHeart Radio or Spotify. Like every other BluOS-enabled product from NAD, the magic is controlled by an app on your phone or tablet. 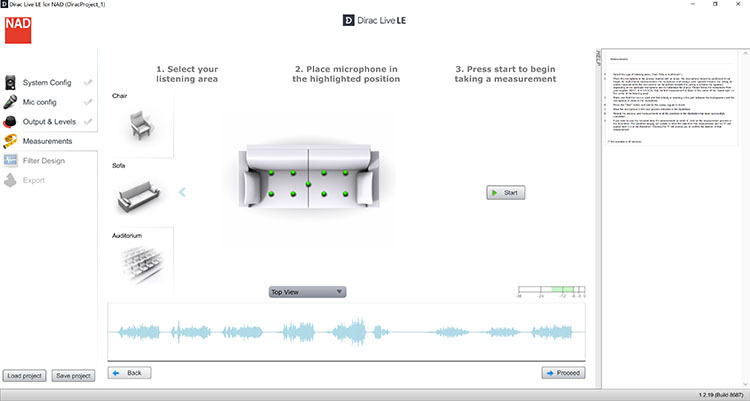 Dirac Live is the latest in a line of room correction systems that began with Audyssey. Fundamentally, these systems have a few common goals. First is to fix frequency response issues that create peaks or nulls in the curve which translates to boomy bass, or harsh mids and highs. Room correction also serves to expand the size of the so-called money seat. That way, more listeners can enjoy optimal sound. It’s also a great way to balance speaker levels and set delays without the hassle of tape measures and SPL meters. 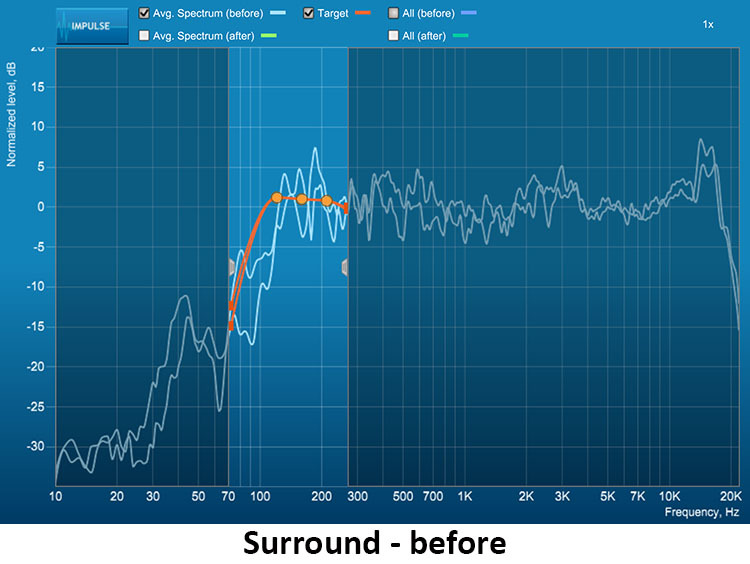 Dirac does all that and adds optimization of the speakers’ impulse response. What this is, essentially, is detailed phase correction. When setting delays in a receiver’s OSD, one can only input the distance to a single channel. This doesn’t address any potential phase issues from that individual cabinet. Unless that cabinet has but a single driver, there will always be phase errors as different frequencies are issued from each driver in the array. The more drivers you have, the greater the correction needed. The problem is further compounded by objects in the room that absorb and/or reflect sound. Dirac corrects these flaws resulting in a more coherent and larger soundstage. 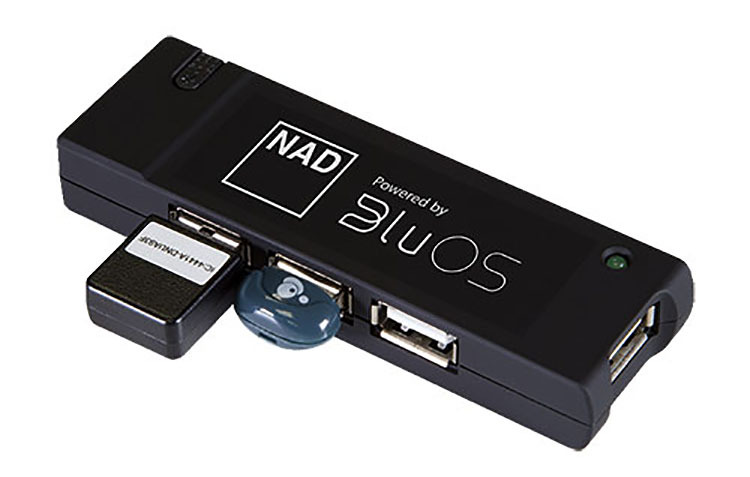 It is implemented through software that can be downloaded from NAD’s website, which means you’ll need a laptop to run the measurements and create the correction filters. A tripod-mountable microphone is included in the box. The T 758’s remote is a basic hand set that is not backlit. It offers discrete power buttons along with individual source keys. They are numbered because any input can be assigned to the available connections, digital or analog, using the OSD. Its navigation is controlled by the center arrow pad. You can access most options just using the front panel display but it’s far easier to use your TV or projector to view the full menu. Installing any receiver requires a fair amount of hardware and software configuration. The T 758 V3 is relatively easy to set up but for best performance, there are a number of things one needs to do. I started with the hookups which meant running seven pairs of cables from my speakers to the rear panel. The binding posts are plastic and seemed a bit loose for my Bluejeans banana plugs, but your mileage may vary. Since they are locking plugs, tightening their collars ensured solid contact. For surround sound, I connected a single HDMI cable between an OPPO UDP-203 and the NAD, then another larger cable out to my projector. I also ran a coax digital wire for two-channel music. The OSD appeared within a few seconds on my JVC DLA-RS640 projector and displayed all the necessary options for source and speaker setup. I configured input 1 for HDMI and input 2 for coax so I could listen to the OPPO with either interface. I find two-channel music to be a little fuller over coax because it bypasses the jitter sometimes inherent in HDMI connections. The first thing I did was to assign the amplifiers to the Atmos modules sitting on top of my Axiom towers. That takes place in the Amplifier Setup submenu. Then I visited Speaker Configuration to set those channels as Dolby Enabled Front. It’s also up to the user to set speaker sizes and crossovers as Dirac only adjusts levels and delays. I used my usual values, then turned to installation of the Dirac software. Within a few minutes of downloading a 64Mb zipfile, I had Dirac running on my laptop. The included microphone plugs into a USB port and the laptop communicates with the T 758 V3 over Wi-Fi. Before doing this, I had to upgrade the receiver’s firmware through the BluOS module. That simply requires adding the receiver as a player in the BluOS app. Once everything’s connected, open the Dirac app and let it find all your hardware. Make sure you have a strong Wi-Fi connection to keep the receiver and software in communication. I dropped the signal a few times and had to re-do several measurements. I wish I could have connected another USB cable between the laptop and receiver to eliminate this inconvenience. Dirac walks you through setting channel levels to a proper value that is neither too loud nor too soft. If you crank the volume, clipping will occur and an error message is generated. I found it slightly annoying that the app wouldn’t tell you there was a problem until the entire measurement run was completed. The on-screen diagram can be set for chair, couch, or auditorium, and the graphic will show you exactly where to place the mic. I measured nine positions before letting the software create its filters. 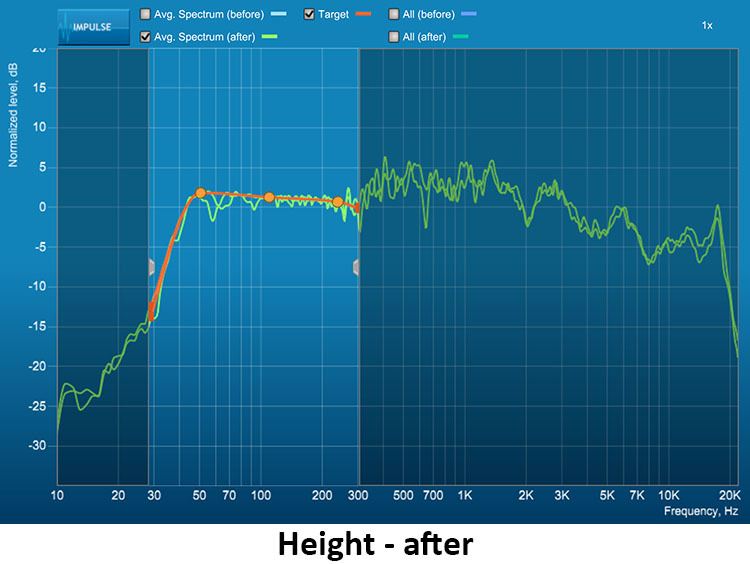 When you get to the chart, you can set the frequency range and the correction curve’s shape before optimizing. I chose to leave them at their defaults. Depending on the speed of your laptop, the software will churn away for a few minutes, then prompt you to save the project, as it’s called. Up to three measurement runs can be stored and you can switch between them in the T 758’s OSD. That makes it easy to create different configurations for music and movies, or two-channel and surround. Dirac adjusts levels and delays but not crossovers, you’ll have to set those yourself. The delays are extremely precise, to the tenth of a millisecond, far more so that what one can do with a tape measure. Here is the room diagram showing mic placement. I used the couch setup since I have two large chairs bolted together. The right seat is my sweet spot so it became my anchor point. The mic was placed at ear level on a tripod. 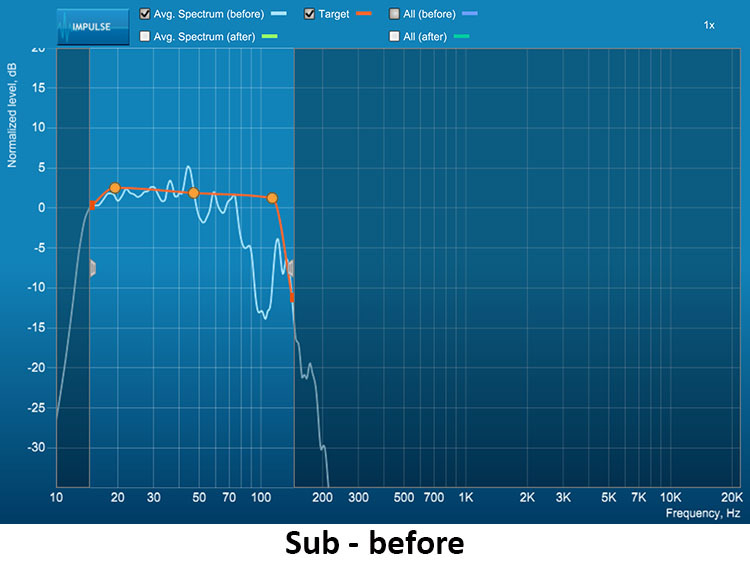 The series of screenshots below shows the before and after charts for each channel. The front, surround, and height channels are taken together as a pair. You can separate them if you wish but I saw no need for that. Whoa! There are some serious issues here. My center has three large ports at the rear that sit too close to the wall. Without correction, it sounds fairly chesty and bloated in the bass. Audyssey normally takes care of the problem but Dirac does an even better job. This is a decent uncorrected chart. 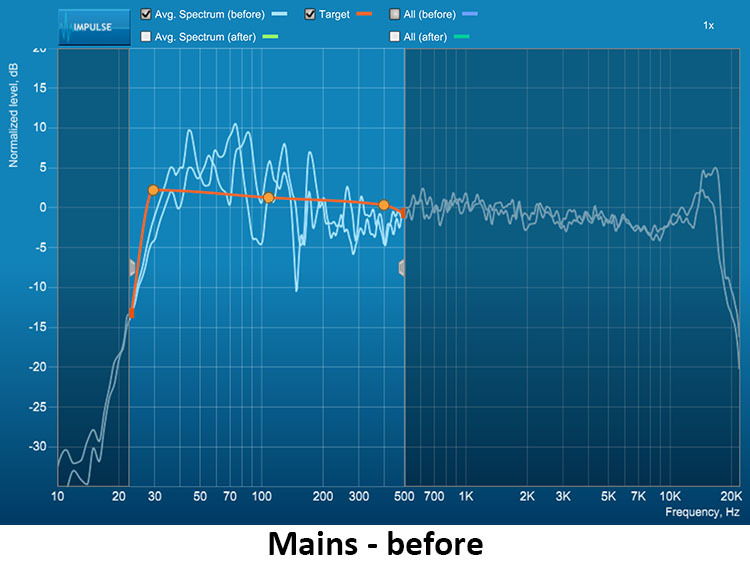 The dip from 70-100Hz isn’t a big factor since I cross the mains and center over at 40Hz. You gotta love that extension to 15Hz though! I know I sure do. And it’s even better with Dirac. Now my surround and height information will be cleaner since those speakers cross over at 100Hz. Once you’ve saved the project, it can be assigned to one of the three slots by dragging and dropping. Then, one can switch between the corrections in the T 758’s OSD. After creating the filters and uploading them to the receiver, there is no further need for the laptop or microphone. This is the first new room correction software I’ve used in a few years so I wanted to listen to a wide variety of material, movies with and without Dolby Atmos, as well as two-channel music. But I began with the Spears & Munsil test disc because I’ve heard its intro and music track literally hundreds of times. Right up front, the bold dynamics of the intro screen had a quality in the bass I’d not heard before. It shook my room without being all that loud. I was surprised at the extra energy given the polite volume level. The balance between what I felt and what I heard was much better than what Audyssey can produce. The piano score was nicely detailed with accents in just the right spots; super-clean and neutral. I’ve reviewed several Blu-ray movies with Dolby Atmos soundtracks, but before today, I could only enjoy them in 5.1 surround. With the addition of two height channels up front, even their reflected sound created a palpable sense of space in the vertical direction. My Axiom speakers and Dirac served up a wide and deep soundstage while the PSB Imagine XAs provided sound that extended past the top of my screen. I felt the bulk of the enhancement was at the front of the room and I could see the potential for even better sound had a pair of rear height speakers been installed. But the Atmos demo disc with its forest scene had no trouble making it rain all around me while birds and leaves fluttered across the room. Dolby Atmos-enabled Blu-rays are still a bit rare but I managed to come with a few titles to watch. The first two are from DC Comics, Wonder Woman and Batman v Superman, Dawn of Justice. I went straight to the action scenes and found them all rich in dynamics and totally immersive. The height channels produced sounds that flew overhead and to the back of the room, even though I have no rear surrounds or height speakers. Atmos adapts to whatever configuration you have so no information is left out. Of equal, or perhaps greater impact was the effect of Dirac Live on dialog and bass. Voices were even more clear and detailed than usual, and that’s saying something. 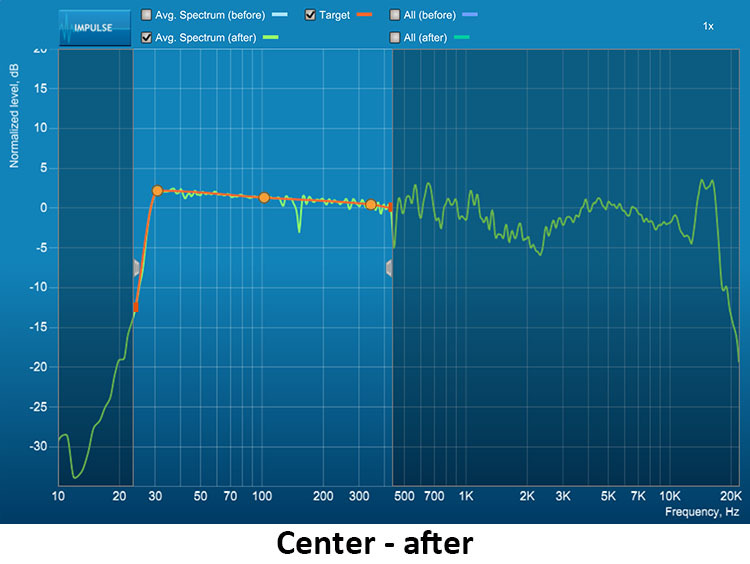 My Axiom center channel is extremely clean and balanced when used with Audyssey correction. Dirac took it to another level entirely. The subwoofer pounded away with tremendous feel and tactility with the T 758 V3 completely in control. I never heard any bloat or distortion. Everything below 40Hz came across in perfect balance. Dolby Atmos is a bit subtle but Dirac makes a huge difference in quality. I finished up my viewing session with Jigsaw which is dialog-heavy and a bit thin on ambient sound. Nonetheless, background cues were always clear no matter how subtle. Here, the T 758’s low noise floor helped the softest sounds come through clearly. Classical selections, especially orchestral ones, are a great test of detail-rendering and sound stage. I started with an old New York Philharmonic performance of Shostakovich’s Symphony No. 5. Fidelity isn’t great but the T 758 managed to flesh out detail I don’t always hear with a tremendous sense of depth and space. I always try to imagine the concert hall where a particular recording was made. The T 758 made me feel as though I were in a perfect acoustical environment with each instrument and section in the proper dynamic balance. The overall presentation wasn’t quite as in my face as what I hear from my Emotiva power amps but the extra detail and transparency more than made up for that. One of my favorite CDs is a collection of French masterpieces performed by the Chicago Symphony and Daniel Barenboim. Daphnis et Chloe, Suite No. 2 begins with fluttering woodwinds underpinned by a subtle drone from the strings. It’s easy for this recording to sound mushy but the T 758 again proved itself capable of finding all the detail present in the material. Toggling Dirac on and off showed clear differences in imaging and soundstage without a change in volume. Uncorrected, the detail was all there but with a narrower focus. Turning the filters on instantly widened the sense of space with a well-placed phantom center image and sound that went beyond my room’s four walls. I couldn’t finish this review without a little rock n’ roll so I put Led Zeppelin’s Physical Graffiti in the player. My favorite song on this album is In My Time of Dying, an ode to slide guitar, played the way only Jimmy Page can. I got a new lesson in analog guitar distortion as I imagined the glowing tubes in Jimmy’s amplifier. Every nuance was plainly audible. The T 758’s low noise floor made decaying notes something to savor. I also needed a little Foo Fighters fix so I cued up Sonic Highways. Each track on this album was recorded in a different studio and the songs are written to reflect the city they were created in. I loved the clear separation of instruments and the neat panning effects between guitars. Butch Vig is a master engineer, and yes, he’s still got it. THE NAD T 758 V3 delivers world-class Dirac Live room correction, Dolby Atmos, and clean neutral sound for just $1300. It easily tops this segment in quality and features. There is little to say against the NAD T 758 V3. At $1300, it sits in a hugely-competitive price segment for AV receivers and frankly, all I need to hear is Dirac Live and I’m done. It may not have a ton of features but it absolutely has the ones that count – clean sound that plays loud without distortion, Dolby Atmos, Ultra HD passthrough, and the best room correction I’ve heard to date. One might wish for more amp channels or DTS:X but honestly, at this price, I defy anyone to show me a better-sounding receiver. I wondered if I would hear the effects of Atmos with just two height speakers reflecting off the ceiling, and I’m happy to say I did. The PSB Imagine XAs created a palpable sense of height in both demo and movie content. If you already have a 5.1 system like me, the T 758 and two additional speakers can take you into the world of object-oriented audio. But the real draw here is Dirac Live, have I said that already? I could live without Dolby Atmos, though now that I’ve heard it in my home, I want it. But I’ll have a harder time going back to Audyssey now that I’ve experienced Dirac. There aren’t a ton of options when it comes to room correction, but when compared to my past experiences, it is a clear winner. I haven’t changed out my surround electronics in many years but this might be the motivation to do so, it’s that good. Finally, the T 758 V3 offers terrific value. I can’t imagine a better-built receiver for $1300. Even without Dirac and Atmos, this would be a good buy. Adding those two things makes it hard to consider anything else. The NAD T 758 V3 AV Surround Sound Receiver earns my highest recommendation. Read the original article published by Secrets of Home Theater here. For more information on Dirac Live, click here. To sign up for the Dirac "Explorations in Sound" newsletter, click here. Newer PostAndroid Central: "Here's how Dirac is enabling Xiaomi to create better audio products"
Older PostVRFocus Recaps VR Developments at CES 2018: "Dirac VR is very Promising to Enhance VR Worlds through Means of Audio"